I really don’t like this new Doom. I realise that is shaping up to be a controversial statement, based on the other early impressions I’ve seen of the game, but I really wonder if I’m playing the same game as these people… or perhaps my expectations with a game that wields the Doom name are simply higher. Related reading: Mortal Kombat X does the fetishisation of violence thing better. Far better. Matt's full review. While I’m not much of a fan of shooters these days, like most kids from my generation, the original Doom really hooked me in. At the time I was simply chalking it up as a good, fun, game, but of course there is much more to it, which is why the game has stuck around as one of the greatest of all time where other good, fun, games, like Heretic, have largely faded from memory. Doom was such an influential game not only because it was fun, but also because it was so transgressive. The game was groundbreaking in the sheer fury that it threw players into. It wasn’t just difficult; it was aggressive, exquisitely violent and slickly fast. It was also visceral; you had to work for your victories, but when everything clicked and you were able to chain together perfect levels of speedy bloodshed, you felt good. And it was a vision of hell and horror that put intensive creativity ahead of commercial interest, and really broke new ground at the time. The combat wasn’t just intense; it was fuelled by the capacity to make you feel panic, because the nightmarish aesthetics, coupled with the hard soundtrack, built an incredibly convincing picture. It’s easy to look at that original Doom now and not realise just why it is such an important game, because technology has progressed far since those days that what we now see in Doom is too abstract to have an emotional impact on us, but in those days Doom’s greatest strength was its most subtle; the worldless narrative of a descent into hell was unbelievably compelling. This new Doom offers none of that. It’s a very competent, fast, difficult first person shooter. And that’s it. The first issue with the game is that it is never quite sure if it wants to take itself seriously or not. On the one hand you’re got a narrative that, generic as it is, wants you to follow along with a story about corruption, and it has a standard anti-establishment sentiment in which a major corporation over-reaches to disastrous effect because it can. Much of this is delivered through static notes that you’ll pick up along the way and can be read from a codex. Even putting aside how common the narrative is, however, it’s all delivered with such a deadpan earnestness that the horribly phoned-in performances simply fail to be convincing, and that’s to say nothing about your silent protagonist, who manages to have even less personality than the Doom guy from decades ago; that Doom guy had a face on the HUD that reacted to stuff going on. This Doom guy is a faceless helmet. The closest Doom guy ever comes to personality is its Easter Egg Doom toys that are scattered about the place. Picking one of these up will see generic Doom guy play with it for a bit, and when he gave the Big Hero Six brofist with one I laughed out loud. Those toys are the closest the game ever comes to being self aware, and it a pity that they weren’t more integrated through the game proper. 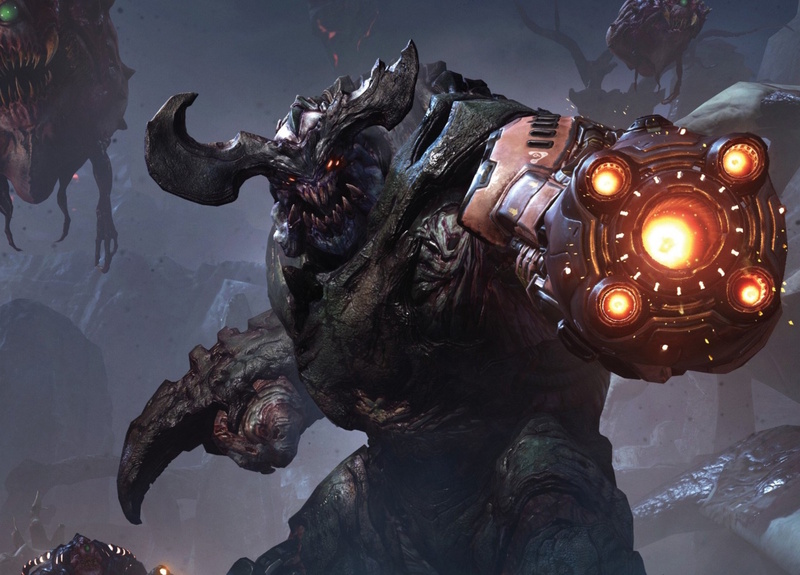 Those toys aside, Doom is an attempt to throw players into an earnest, albeit dark science fiction/ horror mix, and that is an ugly contrast to the most juvenile use of violence you can imagine. That’s not to say the violence isn’t necessary, because it absolutely is when Doom is concerned, but it’s hard to imagine the developers working to any deeper philosophy than “oh my God how awesome are we for these blood effects, guys! More gore! 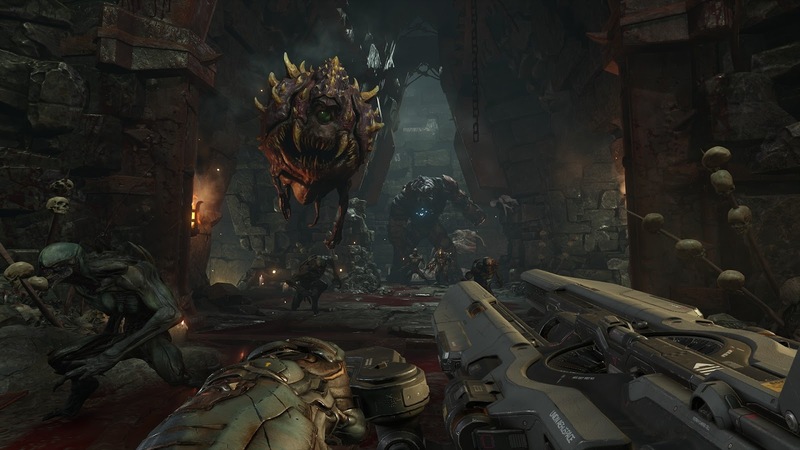 More gore!” Doom encourages you to get up close to enemies and splatter them in melee, by rewarding health and/or ammo boosts for every enemy that’s taken out in that way. So you’ll frequently be crushing skulls with your fists or deconstructing enemies using a chainsaw, and all of that is accompanied with some ridiculously explicit blood effects. The problem for Doom is that none of this is remotely shocking. 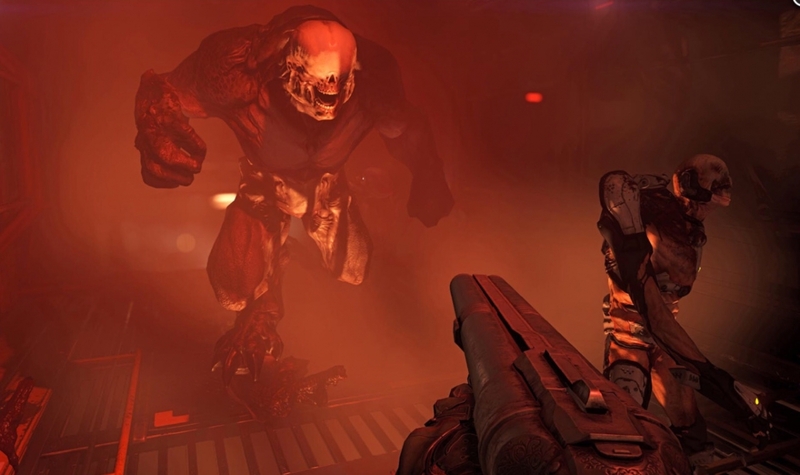 The original Doom was able to capitalise on a relative lack of explicit violence in games and was able to genuinely shock players with its violence; something that it was able to steadily escalate through the campaign. Every level was somehow more intense than its predecessor. This Doom throws all its tricks at you within the first couple of hours, and while the first couple of executions might be mildly eye-opening, for the most part you’ll then cruise through without really registering the gore being splashed around you. Additionally, and oddly for a game this violent, there’s a general lack of focus on the act of being violent. The melee attacks are gory, but over rapidly, and as the animation for those plays out you’re not going to be paying attention anyway, as your focus is going to be on how to deal with the next monster that’s swarming at you. Outside of the combat, there’s the odd dead body and pool or smear of blood on the ground, but the game has almost no interest in showing pain or violence being inflicted. Instead, we’re meant to be spooked out by the odd pentagon on the floor. I expected a far greater degree of fetishisation of the violence than what I got here: Mortal Kombat, Doom is not. After spending hours grinding through a barren, windy, generic Mars landscape and cold, clinical, generic metal factory-like environments, Doom finally gives you a trip into hell itself. This was the opportunity the game had to really shock, terrify, and inspire awe, and in fairness those early Mars stages set up anticipation for that trip beautifully, by projecting well in advance, and frequently, that you'd be making that trip. 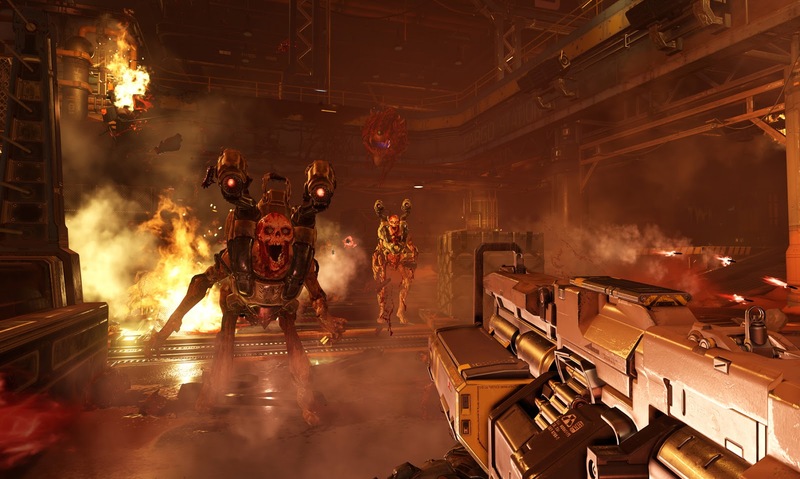 Disappointingly, Doom’s hell is a remarkably safe one, more akin to a stock-standard hostile alien environment than a representation of the depth of sin and evil. That Dante’s Inferno, a particularly forgettable God of War clone in every other way, managed to capture a more creative vision of hell than this game is telling. All of this is a shame, because the gunplay itself is far more akin to what I like to experience in a shooter than the likes of the modern Call of Duty titles. Health doesn’t regenerate; instead, recovering health requires that you find health pickups on the ground. Armour is a precious resource that can also be picked up, and absorbs the damage that otherwise would have impacted on the health. It’s entirely possible to run out of ammo for your favoured weapon. All of this forces you to play fast, and it’s for this reason the game didn’t bother with such things as cover. Doom is at its best when it throws a massive horde of monsters at you in an arena that has vertical levels to it, and then tasks you with running and leaping around like crazy while aiming up shots on the often mobile enemy beasts. I also appreciated that Bethesda left the hunt for keys in this Doom. The original Doom’s charm was, in part, in being frustrated trying to find a damned key for a damned door in order to progress (okay, perhaps I used more explicit language than that). This Doom makes finding those keys a more organic, natural part of exploring a level, but there is nevertheless the sensation of exploring to find them. Ultimately Doom is, like most modern shooters, nowhere near as open as the art direction and level design wants you to believe, but it does a better job of hiding this than some other games out there. So, as I said, the actual gunplay of Doom is satisfying stuff, and the closest the game gets to its visceral roots is blasting a shotgun into a monster’s chest at point blank range. Splat. But the game never lets go of the impression that it’s frightened to truly offend players by doing anything really extreme. 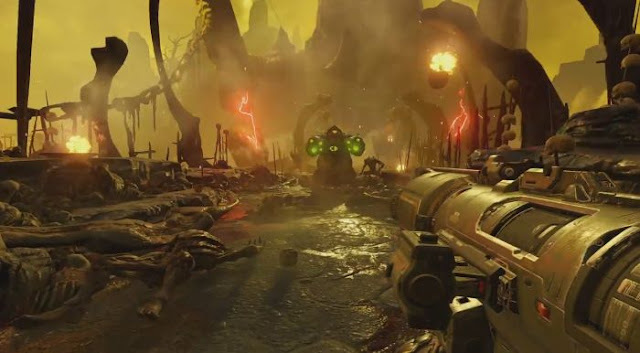 The entire game is designed to neatly touch the orbits of other mainstream FPS titles, and every time it had the opportunity to really do something off course, opportunities that the original Doom would have leaped on, this one takes a step back and throws another generic arena shootout at the player. I’ve already voiced my opinions on the multiplayer from my time with the beta. The full version of the game hasn’t improved in any way, other than to add more content in (and this is why you don’t call a beta two or three weeks out from full release anything but a gameplay demo). It still lacks atmosphere. 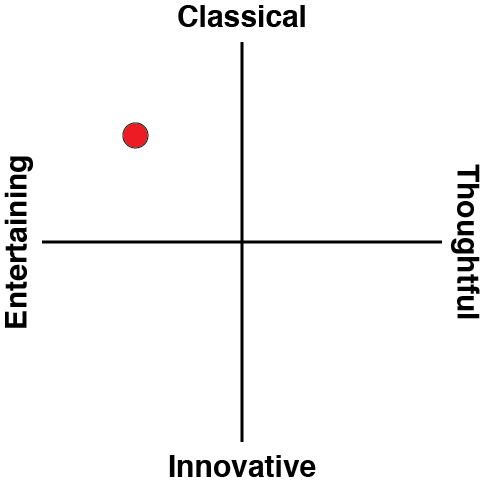 It’s still remarkably competent without actually pushing the genre forwards. It’s still a multiplayer experience that I’m betting will shrink to a tiny community in months. 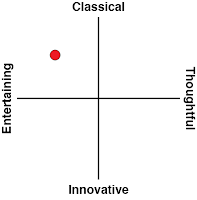 At the start of the review I mentioned that I have noticed that people are generally quite positive on Doom, and therefore it looks like I’ll be an outlier here, but perhaps that’s not the extent of it. Most of the positivity that I have been seeing is that the game “plays well” and “isn’t as bad as expected,” I’m not really denying that in this review. Rather, I think of it like this; people will be talking about the first two Doom games for decades more. Those two games may well be remembered as true classics of the gaming medium a century down the track. This Doom won’t. Like the greedy organisation that unleashes hell on Mars, this is the product of exploitation; the developers at ID Software and Bethesda are playing with fire in treating a property as valuable as Doom this way.